I was lost. Fog had rolled into Achill Island, obscuring any familiar landmarks that may have helped guide me back to Achill Sound and the bridge to the mainland. I’d lost cellphone signal and couldn’t use GPS. There were no County Mayo maps in the rental car either. I had this sense that maybe I’d passed from one life to the next, and my fate was to drive aimlessly around the island for all eternity. It was at this point, when I’d resolved myself to an afterlife of driving in circles, that I saw a sign pointing to a Deserted Village. Sounds like the opening scene in a horror movie, doesn’t it? Well, I had seen The Deserted Village on maps and knew it was to the north of the island, and this helped reorient me. So, with a few hours of daylight remaining, I decided to explore it. At first I couldn’t pick out the village on southern slope of Slievemore Mountain, but as I drew near, rows of crumbling stone cottages became visible. 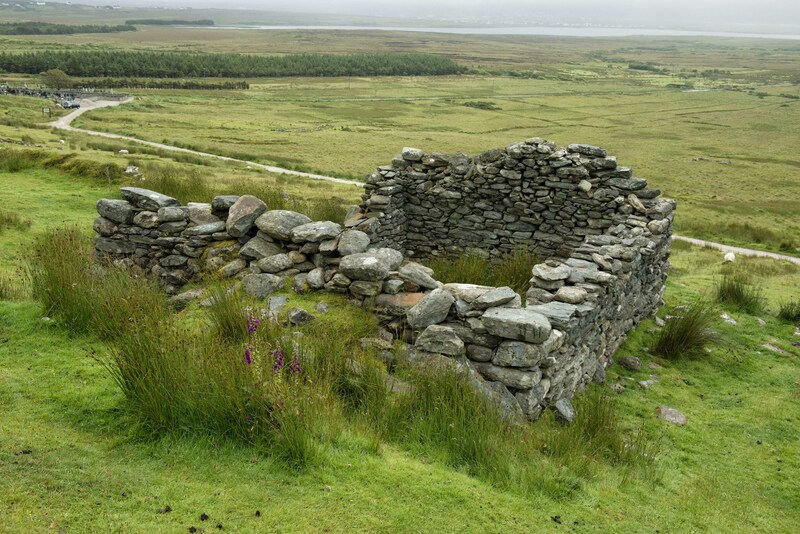 When driving around County Mayo, the ruins of Famine-era cottages can be seen dotting the hillsides. 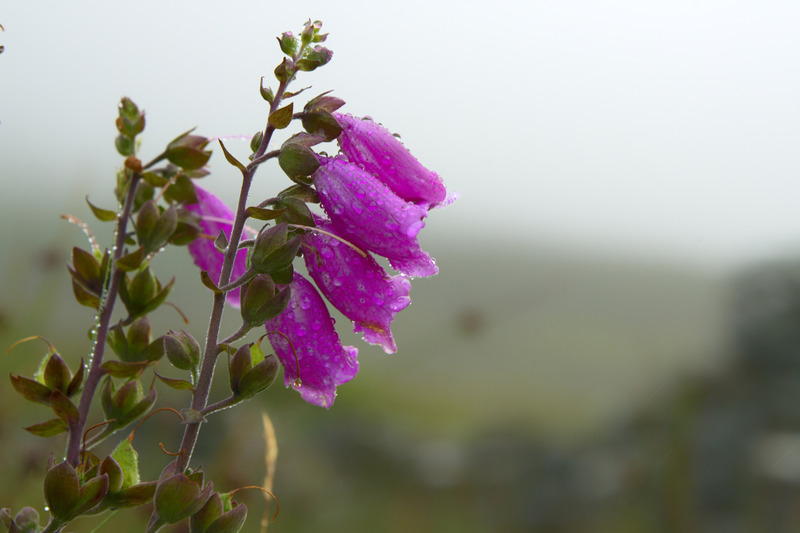 They blend into sloping pasture lands and are easy to miss and impossible to get to because they’re on private property or off dangerous roads. Needless to say, I was thrilled to finally find some that were accessible and to examine them up close through the lens of my camera. Nearly 100 cottages stand in various levels of decay along the base of the mountain, stretching out across a quiet mile. After parking next to a modern cemetery, I walked up a gravel road that wended through time. A village full of ghosts rose before me, and I stood there, unsettled, to be the only living soul. Normally, I liked exploring attractions on my own, but on this occasion, I wouldn’t have minded another tourist or two… The fog didn’t help matters. It was a damp blanket over my head and shoulders, so I decided not go very far on the cold that day (I returned a few days later in the sunshine). When I left the road to explore the first set of ruins, the spongy ground soaked my shoes almost immediately. The terrain was uneven due to falling stones and also because of the lazy-bed fields, systems that redirect rainwater coursing downhill into deep furrows that—at one time—separated potato beds. Some of the furrows were too wide to jump across, and I had return to the path to climb up another section of the village. As I wandered from one cottage to the next, I tried to imagine what life would have been like 150 years ago—peat fire smoke hanging in the air, sheep bleating, children running barefoot through the hills while their fathers gathered the potato crop and mothers tended the kitchens. 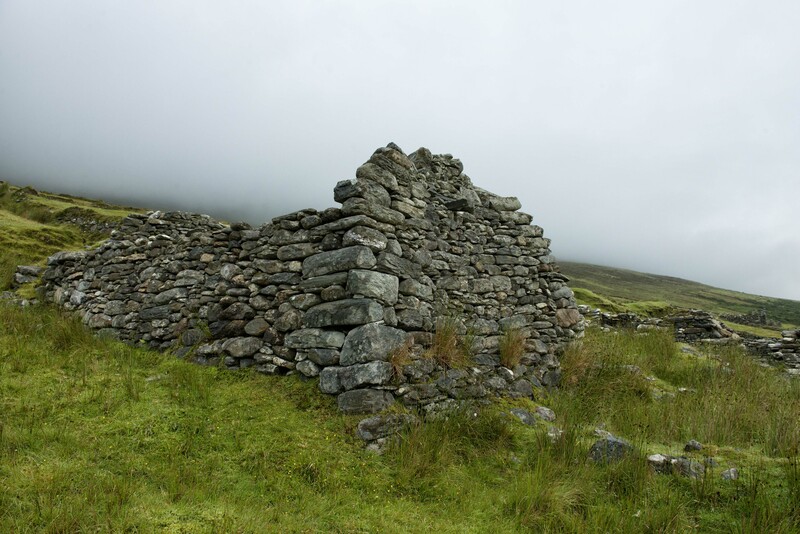 To walk through The Deserted Village is to fall into the past, to commune with yesterday’s ghosts and to think about how, from one generation to the next, our basic needs always stay the same: food and water, shelter, love. A sense of purpose. I came to the conclusion that there are those destined to circle Achill Island for eternity, and they occupy Slievemore Mountain. 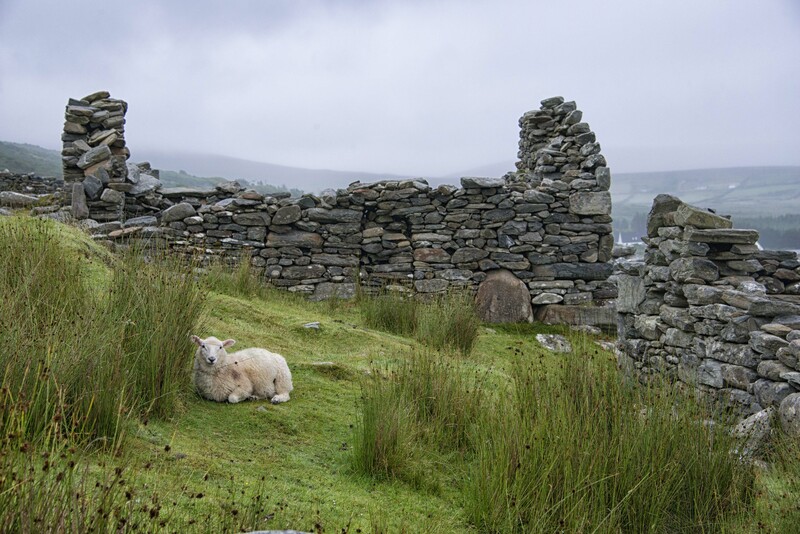 Why not visit Achill Island and see them (the cottages or the ghosts…) for yourself? Just cache your Google map before heading out. Oh, and don’t forget to bring a pair of Wellies!